In the end, you cannot optimize your health without good food. It's just impossible. And this is why learning what we need to do to reverse the massive destruction of our global crop soils is absolutely imperative—both on a personal and global scale. To learn more about Dr. Dunning's ionic mineral products—which include two lines: EcoVie and My Grow Minerals—please seewww.EcoOrganics.com. Acres USA is another great resource where you can find a lot of information about the minerals needed for optimal soil health. 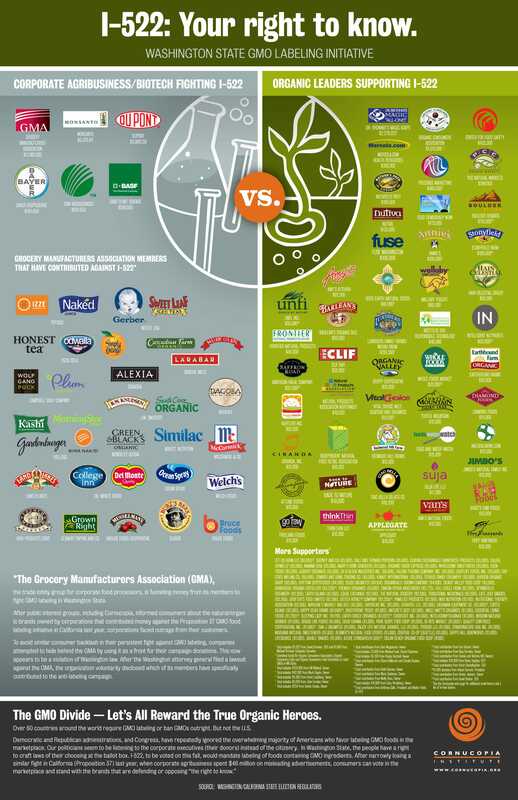 The food companies on the left of this graphic spent tens of millions of dollars in the last two labeling campaigns—in California and Washington State–to prevent you from knowing what’s in your food. You can even the score by switching to the brands on the right; all of whom stood behind the I-522 Right to Know campaign. Voting with your pocketbook, at every meal, matters. It makes a huge difference. By boycotting GMA member Traitor Brands, you can help level the playing field, and help take back control of our food supply.